Linda Lashford is a professional travel photographer and writer who has a beat that extends across Europe. Her photography arises out of encounters with landscape and people and is often characterised by memory, fragility and loss. Abandoning a successful career and turning into a photographic nomad is something I'm sure quite a few of us fantasise about now and again. For most the thought remains fantasy but a very, very small number of people throw caution to the wind and step into the unknown. Linda Lashford did just this and left a job in medicine to travel to Spain and now travels around Europe as Inntravel's chief photographer. Linda found a place with an internet connection long enough to write this featured photographer section for us. I came to photography late (in 2006), after a long period as a doctor and clinical scientist. My education was entirely scientific, eventually becoming a paediatric oncologist with a research interest in new drug development, genetic therapy and clinical trials. After a number of years as an Academic at the Christie Hospital in Manchester, I finally ended up as Director of Translational Research for Cancer Research UK (i.e. initiating funding programmes at the interface of basic science and clinical medicine). I had no exposure to photography until I decided to leave medicine and find a new direction. That new direction was a big leap, new country (Spain), new partner, new life! My partner bought me a camera to help me make the transition. In most photographers lives there are 'epiphanic’ moments where things become clear, or new directions are formed. I'm not sure that pride is an emotion I associate with my photography. There is always a sense of satisfaction when I pull together a series of photographs that is able to say something about how I feel about a place; to describe it in a original and nuanced way. But in general, I make progress through restless dissatisfaction. There was one early moment when I attended a workshop in Yosemite and was taken to Horsetail fall to make 'that photograph'. The jostling chaos made me wonder what I was doing there. Why would I want to make the same photograph that everyone else was taking? I vowed to at least try to be creative, not to photograph the usual views or places, but to seek out something new. The second formative experience wasn't really a moment, but rather the end of a process: one of letting go. In September of last year, after I had my first exhibition, I felt that a line had been drawn under the past and that I could go forward without any more concerns; to photograph freely, without any consideration of form or genres - to cross whatever boundaries I felt like. I think I am a traveller who makes portraits of the places I encounter. So let's just say that I don't consider myself a landscape photographer. I think I am a traveller who makes portraits of the places I encounter. The landscape might be the whole subject, or it might be the canvas on which other things are imprinted (or may not feature at all). I am very fortunate in being commissioned to work across the south and west of Europe, so there are many rich experiences, with both people and their environment. As for landscape photography per se, I love the ritual, the early morning rise, the pull of the sea. Really the final result is less important than the experience. For me it has a duality. When it is the subject, then the appeal is to find a creative and non-literal, way to reveal it. When it forms the backdrop to a story, then the challenge is to find a way of conjuring up the emotion of a place – perhaps evoking memory, abandonment or decay. Photography has released me from a secure life into a creative and nomadic existence. It is often lonely and difficult, but I wouldn't change it! I do everything with my Nikon D3X and a 24-70mm lens. It is heavy but I have confidence in it. If I had the opportunity, I would like to try something smaller, lighter, quieter and even better in low light for my social documentary work. All my images are processed, the degree depending on what I seek to achieve. I open in camera raw, adjust for highlights and shadows, and then move on to photoshop. I am a fan of Nik software, especially Silver Effex pro and all of my B&W is done through this plug in. Apart from that I don't really have any rules: I use whatever tool comes to hand, always finishing with a levels adjustment for final brightness and rarely sharpening, (having used Nik structure to get the sort of edge I'm looking for). I always do my own printing. I keep a printer in the UK at my mother's and one in Spain, so that whenever I come to rest, I can get going. It all began with a mad workshop in Morocco, where I met fellow participants and accomplished photographers, Malie Rich Griffith and Anne Bayin. They got me going. Two years later, David Ward revealed something about the artistic process and struggle, Joe Cornish believed in me and Eddie Ephraums has driven me towards a book. Creativity is fed by being receptive to something glimpsed or experienced, a phrase, a poem, a single painting. And yes, Salgado, who shows that even the most brutal experiences can be revealed through exquisite beauty, Koudelka for his 'Gypsies' and Strand for his ability to set landscape in a story. Can you choose 2-3 favourite photographs or series of photographs (if that’s easier and perhaps choose some from this series) from your own portfolio and tell us a little about them? It's difficult to choose favourites. I suppose I am most drawn to landscape images that somehow transcend the subject. That become something other. My series 'Intimations of landscape' takes a non literal view of the landscape genre and draws either directly from landscape or from abstract forms that are able to evoke a sense of landscape. 'A river runs through it', is much more literal evocation of landscape. My third choice, and most recent image (so it still needs to stand the test of time), is inspired by a tiny painting glimpsed in a Welsh art gallery. The painting was primarily green, set in a gold frame and there was a sense of a lost building floating in a forest. For this image of ash trees, I have made 2 exposures, the background is captured by vertical panning over which I have superimposed the same scene as a still image. The result gives a sense of something fragile, impermanent, I think. Photography is an integral part of everything I do, so the difficult part is channelling the 'work' experience into something more creative. My life is centred around travelling – I spend approximately 10 months of the year on the road, fulfilling photographic commissions and developing walking and other journeys for the independent holidaymaker. Photography is an integral part of everything I do, so the difficult part is channelling the 'work' experience into something more creative. There isn't always a distinct separation: everything I see may be an influence, but carving out time to incubate and execute the ideas is always a problem. Sometimes, I just have to lay down my thoughts and wait for another year. Both. This year I have been keeping an e-photographic journal, jotting down my thoughts and impressions and collating groups of photographs as I go. Some series have arisen spontaneously during the year's exploration, but there are also nuggets of ideas that will need thoughtful development and planning to reach maturity. Having said this, even the most spontaneous of photographs contain echoes of past experiences. For example, I can see that my Provencal 'Intimations of Landscape series' is part of a continuum that began with 'Trappings of Light' (an exploration of a disused cork factory on the Portuguese border), a visual journey through southern Italy until I ended up with a maturing idea in France. It's just important to get started. I stalk my subject and eventually it takes over. In the end the process of photographing stills the mind. I have summed up the photographic process for me in the words 'turbulence, quest, serenity, song'. It begins in tumult but ends in an outpouring of emotion. Printing is pleasure left for that brief period when I return home. I'm always working on an idea, so these are the photographs that get printed. These are my 'songs'. It's important to me to have several strands of work on the go, so that I can channel my photographic energy wherever I am. I have a long term commitment to a series of photo essays that describe life in Spain: these are an amalgamation of documentary landscape and people. 'Living with Loss' and 'People of the Sierra' are pretty much completed, and I am contemplating 'Barrio' and 'Casino' (a sort of old peoples club) as the next subjects. More demanding as a subject is memory and the many ways of evoking it. Keeping a journal has taught me it is a central theme in my work and I shall be thinking more about what this means to me. I am working with poetry and prose and it may be that writing will become increasingly important in my work, so that photography may sometimes become an echo of my words (rather than the reverse, which tends to happen at the moment). But we will see! The most important thing is to stay open minded and receptive, and be prepared to fail. 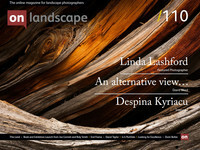 You can see more of Linda’s images at http://www.lindalashford.photoshelter.com and at the Joe Cornish gallery, Northallerton. Her documentary series are available as free downloads for an iPad (through iBooks). Email her through her website for a link.